We’ll start things off in the Midwest where temperatures made a complete 180 from April to May. Our warmest spot this month takes us to the capital city of Illinois where residents dealt with their warmest May on record. In Springfield, all 31 days of May featured above average temperatures with 17 of those days reaching at least ten degrees above average. Eight days topped the 90-degree-or-better mark making for the 6th highest number of such days for any May on record. Take note: the average number of 90-degree-or-better days in May in Springfield is one. One of those hot days set the mark for the second warmest high temperature ever recorded in the month of May at an unseasonably warm 98 degrees. In a month where high temperatures typically range from 70 to 79 degrees, this May featured 29 days where the mercury exceeded 80 degrees. 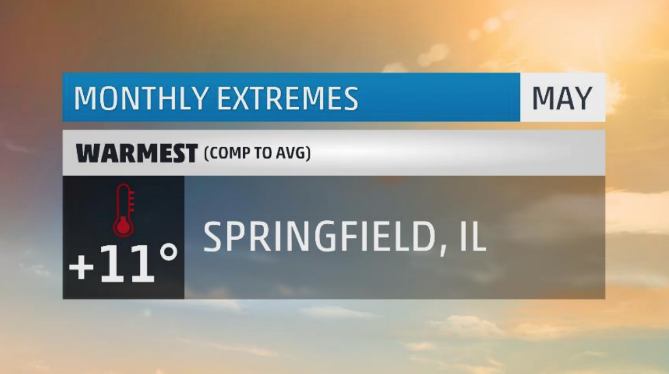 With five straight days of 90-degree-temps, Springfield set its 11th earliest heatwave on the calendar as well as their 2nd longest May heatwave. On the other side of the dial, overnight temperatures were just as warm. Springfield set their 3rd warmest overnight low for any May at 73 degrees. In a month where low temperatures range from 48 to 57 degrees, 27 low temperatures exceeded the 57-degree-mark. In all, Springfield would set 14 individual daily high temperature records and another 8 individual daily warm low temperature records. And to think, April was their 9th coldest on record. What a temperature whiplash! The transition from April to May felt more like going from the ice box into the furnace. 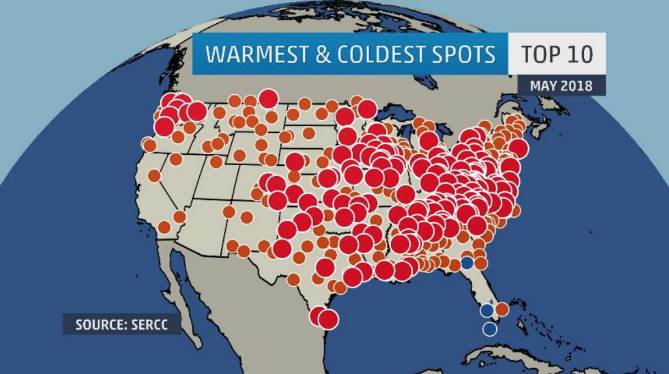 Whereas April felt more like a never-ending winter with shot after shot of cold air, May brought rampant heat to just about every corner of the U.S. Over four hundred locations recorded one of their top ten warmest Mays on record of which 148 saw their warmest May. 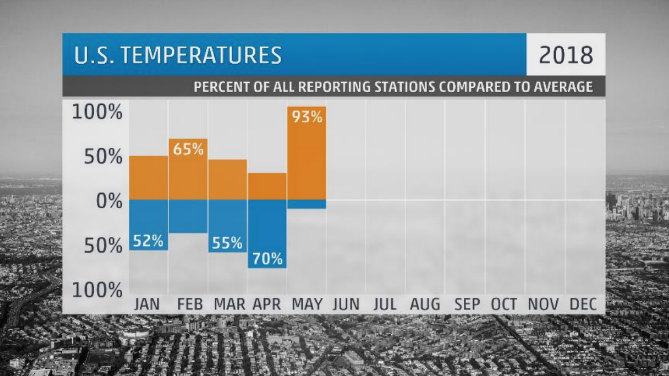 Crazier yet, 36 cities went from having their coldest April to their warmest May on record. 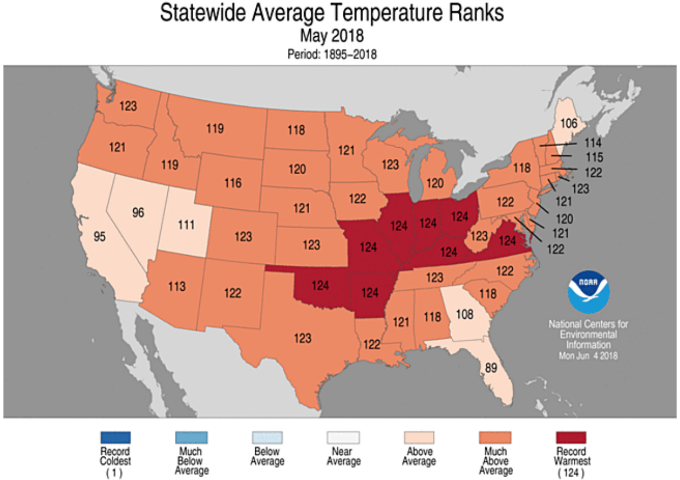 It was the warmest May on record for the contiguous U.S., including the warmest May for eight separate states. Not one single state ended the month near or below average. During May there were over eight thousand record warm daily high and low temperature records. Several of the daily records were noteworthy, including 100-degrees on May 28 in Minneapolis – the earliest such occurrence on record. Triple digit heat spread up through the Plains and into the Midwest. Minneapolis, Sioux City, Omaha, and Wichita all saw early 100-degree days. 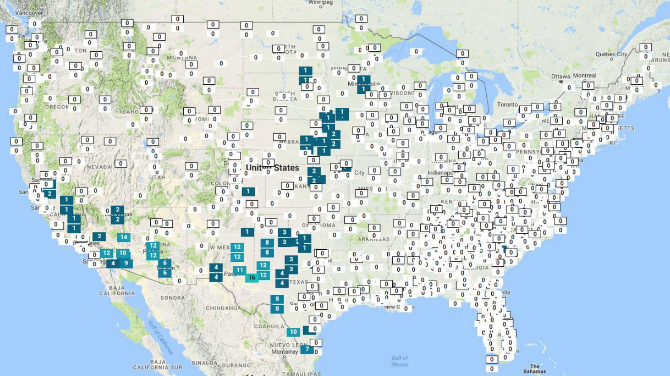 Over 700 individual weather observation stations in the U.S. reported above average temperatures for the month of May. This bucks the trend this year of mainly cooler than average temperatures across the lower 48. Trying to find the coolest place in the U.S. in May was like finding a needle in a haystack. When only 7% of weather reporting stations recorded a cooler than average month, it’s pretty slim pickings for the “top spot”. Compared to the double digit departure our warmest city saw this month, our coolest spot barely registered with a paltry two degree departure from average. For our coldest spot this month, we’ll travel down Florida’s east coast to Fort Lauderdale where things weren’t necessarily cold, but certainly gloomy and gray. As for records, this was Fort Lauderdale’s 34th coldest May on record. Twenty-four days had below average temperatures, but each of these had a departure less than five degrees. Wet, cloudy weather was persistent during the month of May. Twenty-four days featured measurable precipitation and all thirty-one days were mostly cloudy or worse. 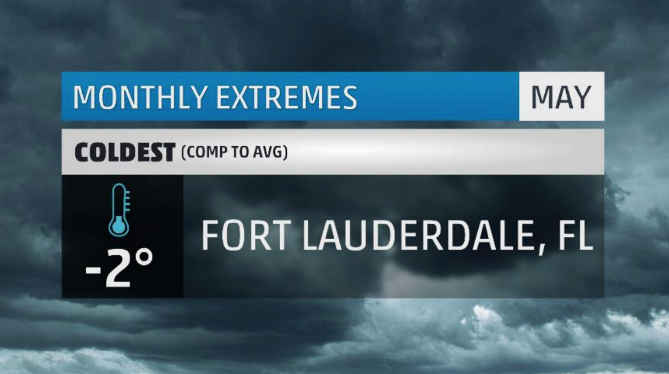 It ended up being Fort Lauderdale’s 3rd wettest May on record. The persistent gloomy weather didn’t provide a lot of wiggle room for temperatures. In fact, the average difference between each day’s high and low temperature was only nine degrees. As you can tell, there wasn’t much cold to write home about in May. 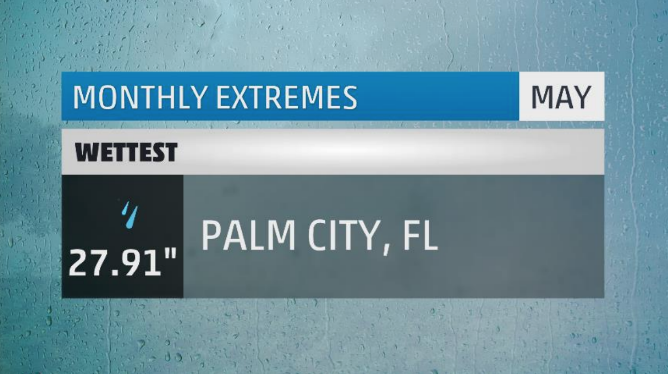 Just an hour up the road from our “coolest spot” is the town of Palm City where dry days were few and far between in May, and close to 28 inches of rain fell this month. Not only was this Palm City’s wettest May on record, but it was also their wettest month of any month on record. There were eighteen days with measurable rainfall in May, and ten of those dropped at least an inch. In just one week, Palm City picked up 17 inches of rain without a dry day in between. That was both the longest stretch of wet weather in any May and the 2nd longest for any month on record. For May, Palm City set their 2nd, 4th, and 9th wettest days in the month. 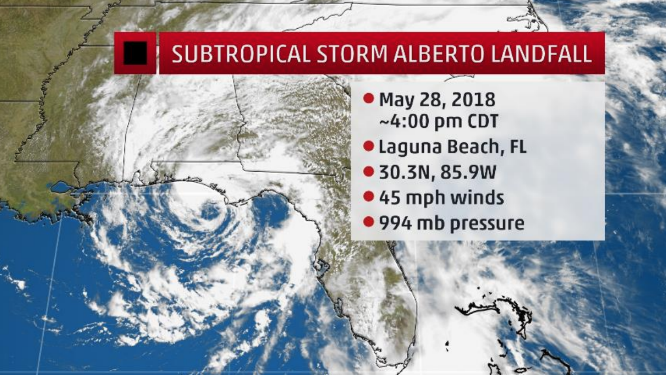 The rain was brought about by two factors: a Bermuda high which funnelled an exceptionally moist airmass over Florida and the southeast U.S. for weeks, and added moisture from Subtropical Storm Alberto – our first named storm of the season. Within the soupy air, Palm City’s average hourly dewpoint was a sultry 72 degrees. That’s air you can cut with a knife! Currently, this is Palm City’s 4th wettest start to the year. 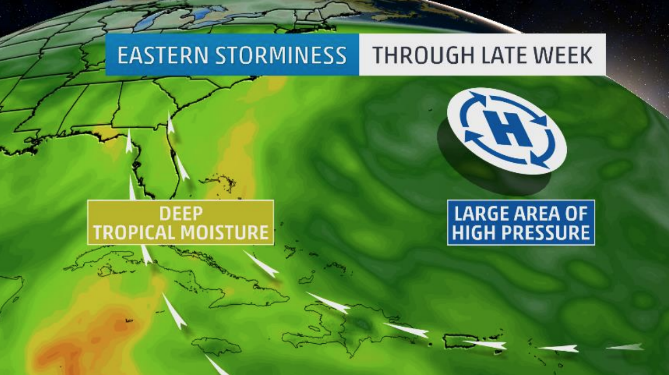 The two wet weather culprits: a stubborn area of high pressure near Bermuda, and what was Subtropical Storm Alberto. Each provided ample moisture and heavy rainfall from Florida through New England. The rounds of rain led to numerous flash flooding events, including emergencies in Georgia, the Carolinas, the Virginias, and Maryland. 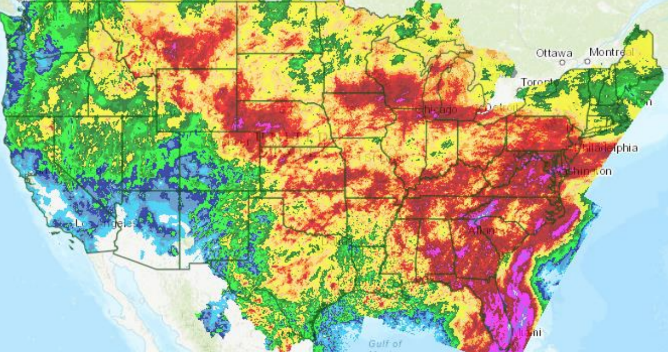 Many areas along the east coast saw as much as 2 to 6 times their monthly average rainfall this May. Two hundred and nineteen locations would see one of their top 10 wettest Mays. 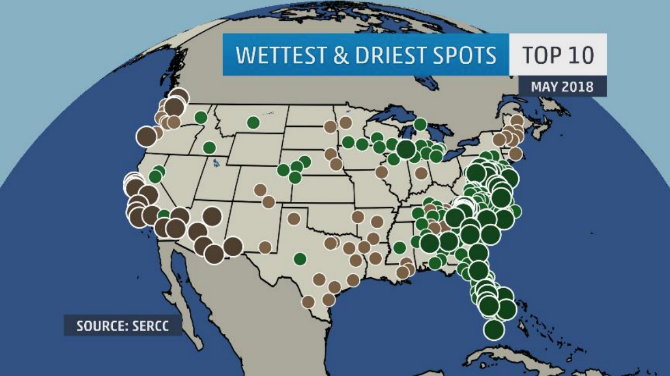 Record wettest Mays occurred in a number of east coast cities from Key West to Richmond. In stark contrast, 72 cities from New England to Texas and across much of the West would see one of their top 10 driest Mays on record. Typical wet cities like Seattle, Quillayute, Portland, and Olympia all saw either their driest or 2nd driest May on record. Yes, it snows in May. Even in the face of rampant warmth this month, there were a few places aside from ski resorts and mountain tops where snow made it to the ground. Now, that doesn’t mean these places saw a lot of snow. In fact, every single site in our 800-wide observation network that saw snow in May, saw less than an inch. Our snowiest spot managed just seven-tenths of an inch in May. That spot would be Ely, Nevada. What was settled as a gold mining town, Ely managed to strike wintry gold this May with just enough snow to top our list. Ely is no stranger to May snows, in fact, this May’s seven- tenths of an inch ranks 44th snowiest. This makes for the 51st May with snow in Ely going back 126 years. In an average May, they will see around two inches of snow. It was barely cold enough to snow as temperatures soared into the 60s, 70s, and 80s all month. The snow that fell came overnight as temperatures dipped into the 30s. As with most May snows, it was gone by noon the next day. Believe it or not, but snow can fall in Ely even into June. 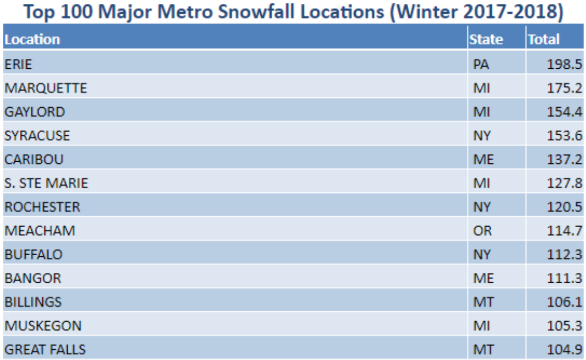 In fact, thirteen Junes have seen measurable snow with the most recent being 1995. How about that? Now that we’ve reached the end of winter, we can do a little recap in terms of who saw what. 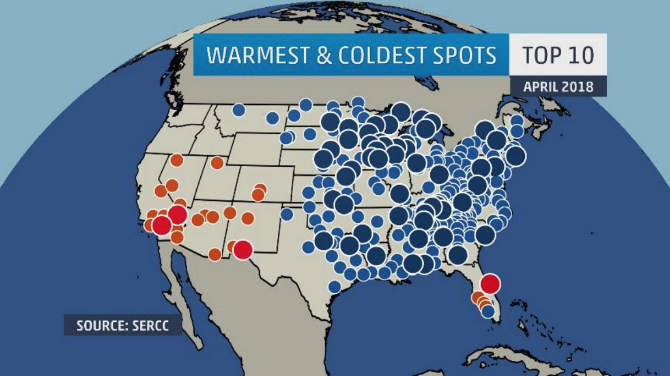 Quite a few major cities topped 100 inches this winter, including Erie, Buffalo, and Syracuse. Then there’s everybody else. Snow fell in every state, and in places like the Florida panhandle and the southern tip of Texas. The ranger station at Mt. 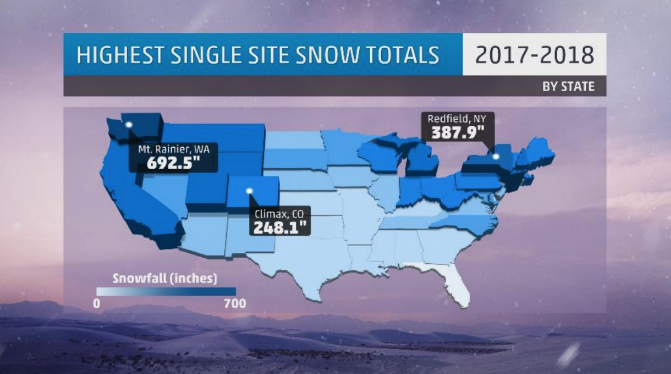 Rainier, Washington picked up almost 700 inches of snow this winter. That’s about eight Andre the Giants worth of snowfall! Yes, that is the official unit of measure for the Monthly Extremes article. Shades were a necessity in the sun-soaked southwest this May. 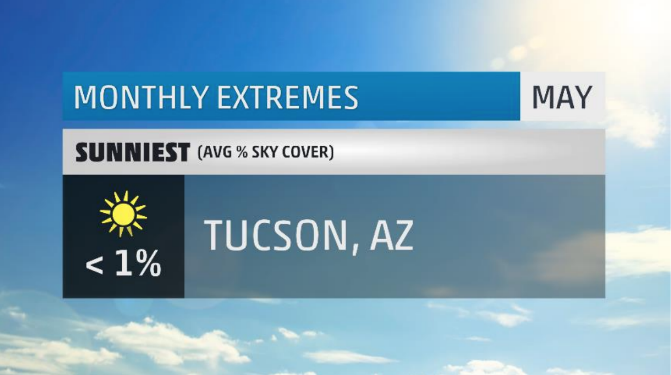 Our sunniest spot this month was Tucson, Arizona, where all thirty-one days of May were brilliantly sunny and cloud-free. All of this would be fine and dandy if it weren’t for a persistent drought that has plagued the area since late last year. No rain fell during the month of May, tying the record for driest May. Their most recent measurable rainfall occurred back in February, and as of the end of May, it has been 92 rain-free days. From sun-soaked and parched to waterlogged and gloomy we go to our final stop this month and the cloudiest spot in the nation. It should be surprise that with the onslaught of tropical moisture, our cloudiest city would fall somewhere within the southeast. Lo and behold, Miami takes the prize. This May there were zero sunny days in Miami. Fifteen days were mostly cloudy or worse including 7 completely overcast days. All the cloud cover produced 23 days with rainfall making for Miami’s 4th wettest May on record. 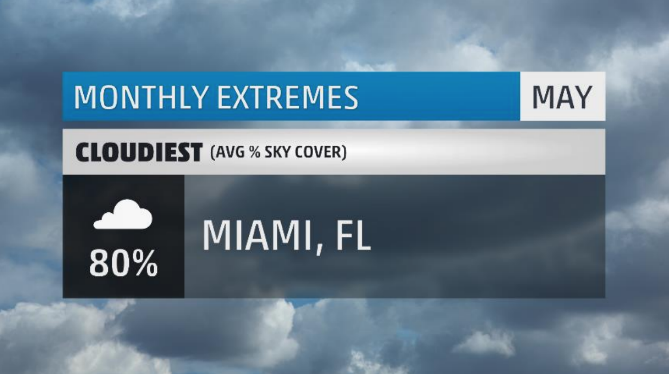 Miami is actually the 9th cloudiest city in the U.S., averaging 290 cloudy days per year. As the Florida wet season begins, clouds become second nature between now and October. 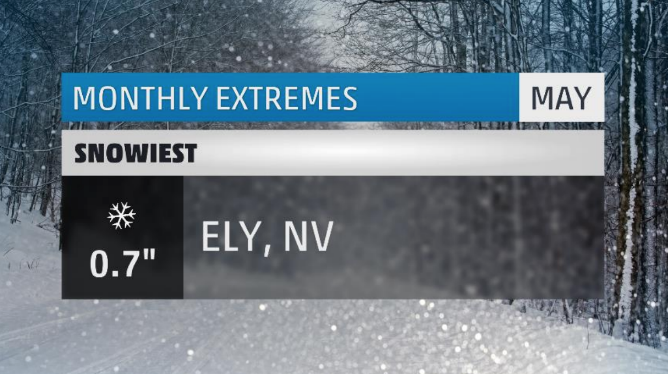 There you have it, the extremes for the month that was May 2018. Make sure to check back next month to see what May has in store! What weather extremes did you face in May where you live? Let me know in the comments below.